Armenian architect, member of the Academy of Architecture (1914,) USSR Architect (1926) In 1904, he graduated from the Department of Architecture of the Higher Academy of Beaux Arts at St. Petersburg, with the title of painter-architect. In 1917, Tamanian accepted the position of President of the Council of the Academy of Beaux Arts at Petrograd. He was elected the president of the Artists’ Association. 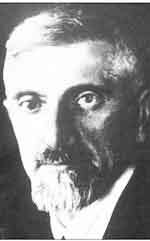 In 1919, he moved to Yerevan, and then in 1921, to Iran. In 1923, he was invited to Armenia. From 1923 on, he was the chief of the Committee of Preservation of Historical Monuments. Alexander Tamanian died February 20, 1936. Yerevan’s master city plan was Tamanian’s first architectural work. Besides many quarters, the observatory (1930-1935,) the annex of the Department of Anatomy of the Institute of Medicine of Yerevan (1926-1933,) the Government House (1926-1929,), the Opera and Ballet Houses (1926-1953,) the Institutes of Veterinary Science, Politechnique, and Physiotherapy (1927-1932), the Public Library (1932-1938,) and the borehole of Lake Aygher were all based on his architectural designs.